Reincarnation for my stuff by way of recycling and reimagining. I am BEYOND nerding out to have been able to share this most recent project with the super, fabulous How-Tuesday! You're probably already familiar with this weekly staple on the Etsy blog, but if not, now is a great time to introduce yourself! It consistently posts some of the most fun and fantastic projects from all over. Seriously. Thank you so much to Julie for inviting me to share this project with the Etsy community! In general, I feel pretty excellent about my resourcefulness when it comes to upcycling, but there are a few items that make me wonder if maybe I'm treading a little too close to hoarder territory. 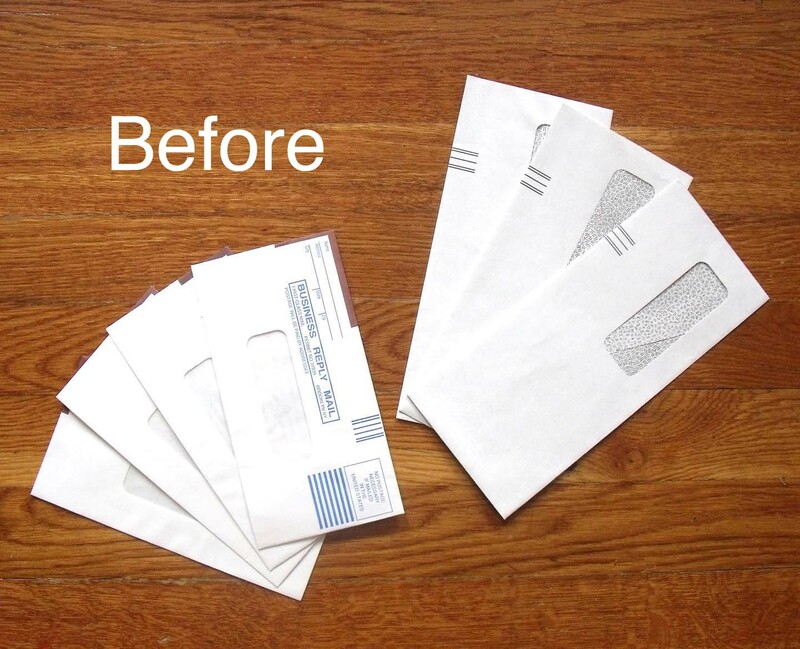 Primarily, the envelopes that come enclosed with junk mail. 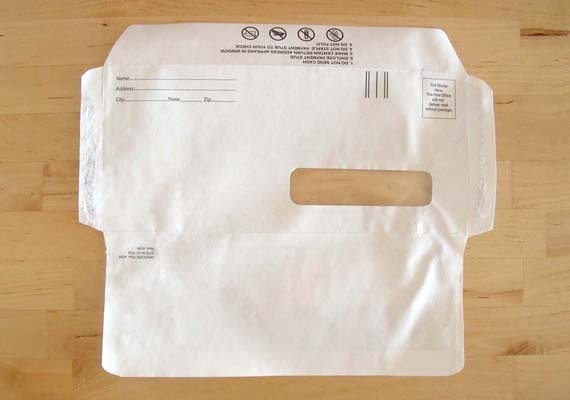 As I rip up all those credit card offers, I can't help but feel guilty about the perfectly good envelope that's being wasted, too. So for years now I've been rubberbanding their ilk together and throwing them in a drawer. I so love this project because it finally gave me something to do with all those things! 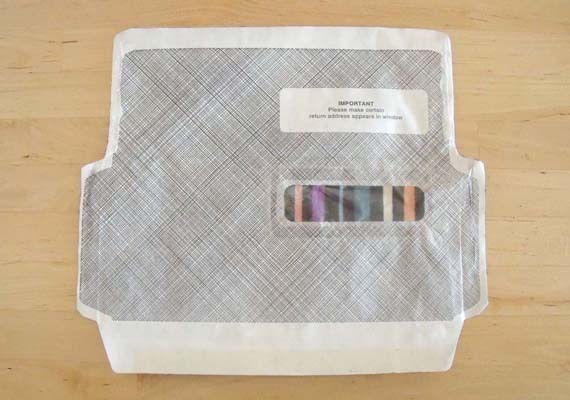 Plus, I get to use some of the remnant fabric that I have WAY too much of. Yeah, scrap fabric is totally another one of those hoarder items for me. 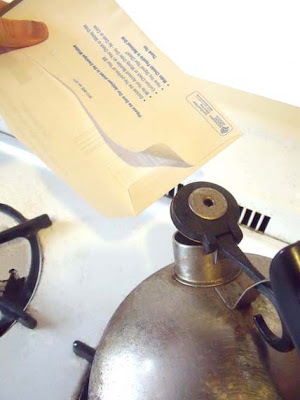 Step 1: Steam open the flaps of the envelope. Step 2: As the steam begins to lift the edges of the flap, pull it upward. You may have to pull a little bit at a time as you continue to steam. 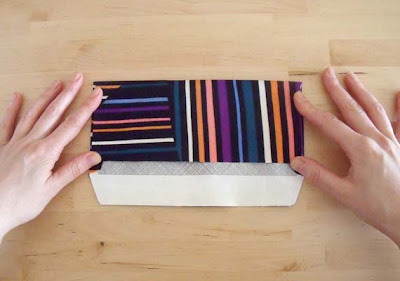 When you're finished with this step the envelope may look a little wrinkly, like this. That's normal, especially if your envelope has a plastic window. Most wrinkles will come out when you spray it with the adhesive, but if it's excessively wrinkled, you can lay something heavy on it for a bit. Step 3: Lay the fabric out flat and place the opened envelope over it. Cut all around, leaving at least an extra 1/2" on all sides. 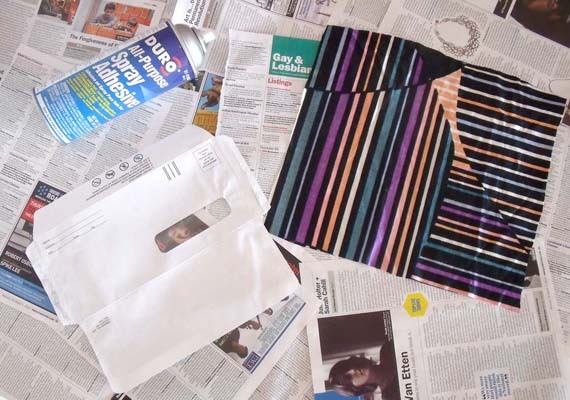 Step 4: The next step is to spray both the envelope and the fabric with adhesive spray. 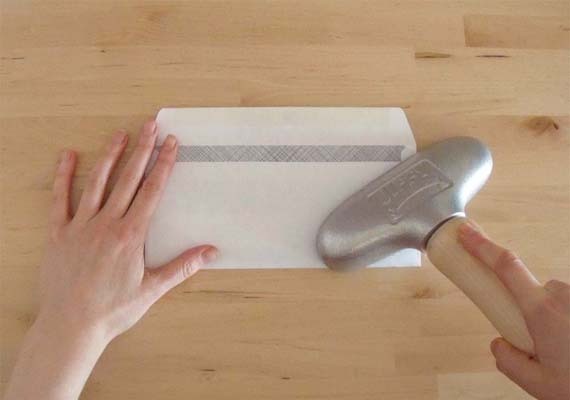 Before you do this you'll need to lay out some paper to protect your work surface. Also, it's important that you only use the spray in an extremely well ventilated area, preferably outside. ** Please note that wheat paste maybe substituted for the adhesive spray used in steps 4 +5. 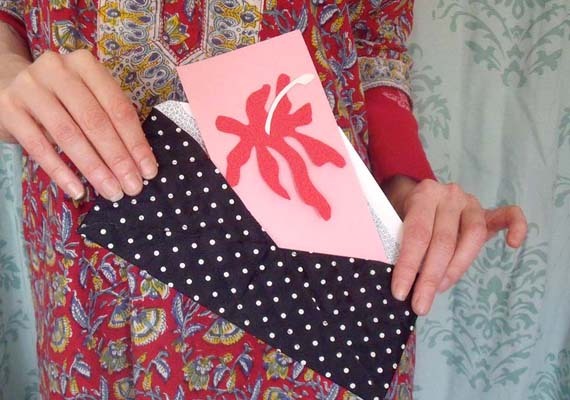 It's a more eco-friendly alternative that's not only bio-degradable, but will make this craft more kid-friendly, as well. 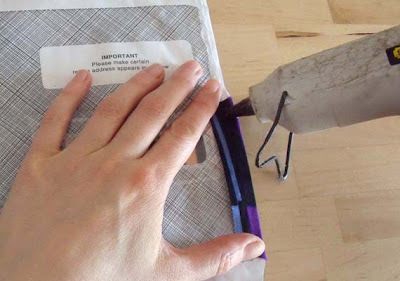 Step 6: Gently lay the fabric over the envelope, so the sides with the adhesive are touching. Flatten out any wrinkles or air bubbles until the surface is totally smooth. 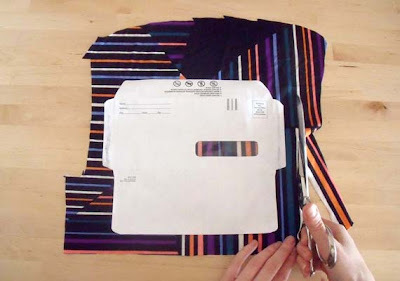 Step 7: Trim the excess fabric away from the envelope with a pair of scissors. Step 8: Lay the envelope face down and bend in the two smaller flaps. 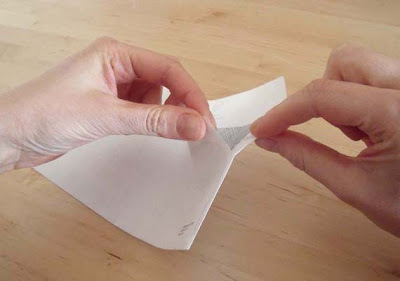 Step 9: Run some hot glue down the two flaps you just folded. 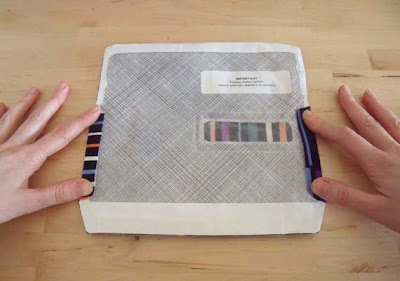 Step 10: Fold the large flap up to cover the two small ones. Rub your finger over the two glued areas to make sure they properly adhere. **As an extra step you can trace the dimensions of the envelope onto a sheet of paper. Reduce the size by an 1/8" on each side and cut. 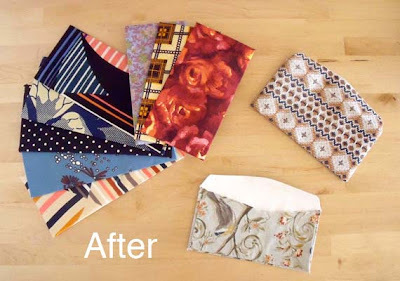 This will give you a perfectly sized template, especially nice if you'd like to make handmade note cards to fill the envelopes with. Thank you! Love the padded envelope idea. Can't wait to try that during my next batch of these. I just received my first (of I'm sure many to come!) 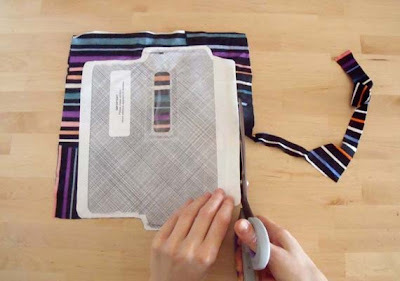 order of Japanese tape. I love this idea and can't wait to try it out. Hi, I'm Kat! I live in Brooklyn where I work as an artist, accessories designer and teach tons of fashion classes, covering everything from shoe making and handbags to leather jewelry and fashion illustration. I am OBSESSED with recycled DIY and want everybody else to be, too! We Can Re-Do It is my attempt to convert the masses! I love combining scraps, various thrift store finds and whatever I happen to have around to transform them into new objects, that are better than they've ever been. 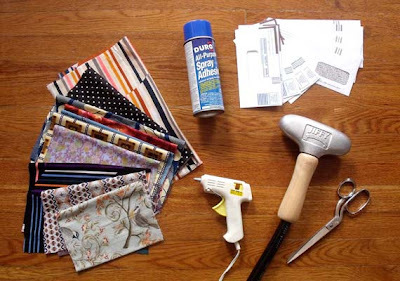 There's no reason why upcycled projects shouldn't look like a million bucks (even when they're free). I love to know what fabulous upcycling other crafters are up to! If you'd like me to feature some of your beautifully photographed projects feel free to email me at sateenduralux(at)gmail(dot)com. What's even better than crafting? Crafting with friends, of course! I'm frequently out and about sharing what I do at workshops, museums and with friends for private craft nights. If you or your organization would like to hire me to do an event, please send me an email at sateenduralux(at)gmail(dot)com.